Concentrations of the compound D5 siloxane, which is commonly used in cosmetics, show a large spike during rush hour. Millions of Americans apply personal care products every morning before heading to work or school. But these products don’t stick to our bodies permanently. Over the course of the day, compounds in deodorants, lotions, hair gels and perfumes evaporate from our skin and eventually make their way outdoors. Now there’s new evidence to suggest that these products are major sources of air pollution in urban areas. For decades, motor vehicles were considered the primary source of air pollutants in major U.S. cities. Vehicle exhaust contains multiple pollutants that worsen air quality, including nitrogen oxides, particulate matter and volatile organic compounds (VOCs) – a group of reactive gases that contribute to smog formation. Thanks to advances in catalytic converters and improvements in fuel economy, combined emissions of common pollutants from cars have decreased by 65 percent since the 1970s. Air pollution is still a problem in urban areas like Los Angeles, but only a fraction of it can be attributed to vehicles. Today, scientists are finding that other non-combustion sources – including common household products – are also major contributors. 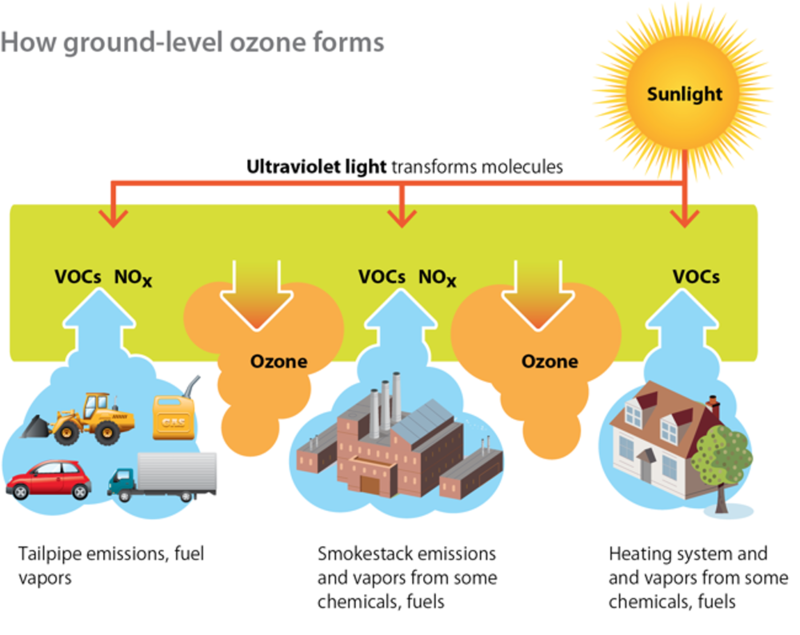 Volatile organic compounds (VOCs) react in the air with nitrogen oxides to form ozone and smog. In a recent study with U.S. and Canadian colleagues, our lab found that these sources can include personal care products. We analyzed urban air in two cities: Boulder, Colorado, and Toronto, Ontario, Canada. In Boulder, our lab had recently invested in new instrumentation, which we wanted to use to measure wood stove emissions during winter months. For five weeks we sampled air from the roof of the NOAA David Skaggs Research Center in hope of measuring air parcels contaminated with smoke from residential wood stoves. Surprisingly, we noticed a signal that stood out unexpectedly from all the other data. This compound, which we identified as decamethylcyclopentasiloxane (or D5 siloxane), contains silicon, which uniquely differs from the organic compounds we normally detect. Many labs have studied the environmental fate of D5, but from our perspective it is particularly useful because it acts like a fingerprint. If we detect D5 in the atmosphere, we know that the air mass we measured was influenced by emissions from personal care products. By comparing the amount of D5 in the atmosphere to other fingerprint markers, such as compounds present in vehicle exhaust, we can estimate how important personal care products are as an emissions source relative to better-understood sources. 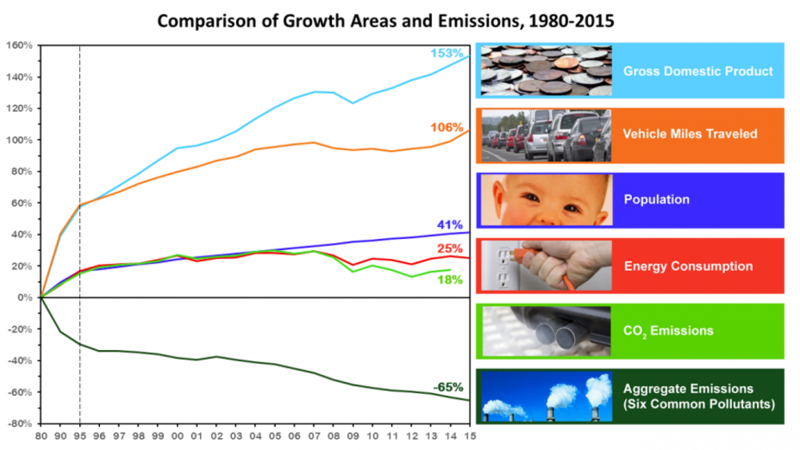 Air pollution from transportation in the U.S. has fallen in the past 40 years even as population and vehicles miles traveled have increased. D5 concentrations were highest in the morning – the time when most people shower, apply personal care products and then leave the house to commute to work. We also observed a peak in benzene emissions in the morning, when people drive to work. During morning rush hour, we found that emissions of D5 and benzene were almost equivalent. In other words, at this time of day, people emitted a plume of organic compounds that was comparable in mass to the plume of organic compounds emitted from their vehicles. Researchers still have a lot to learn about how these chemicals react in the atmosphere to form smog, so the air quality implications of these morning emissions remain unclear. Benzene emissions remained high throughout the day as people drove around the city, but D5 emissions eventually tapered off as personal care products evaporated from users’ skin. We estimate that, on average, the entire population of the city of Boulder emits 3 to 5 kilograms (6 to 11 pounds) of D5 per day, and that their cars emit about 15 kilograms of benzene in vehicle exhaust. While these numbers may seem surprisingly high, our findings support recent modeling work conducted by Brian McDonald, a co-author of this study, which showed that personal care product VOC emissions in Los Angeles now rival VOC emissions from gasoline and diesel exhaust. Taken together, these two studies demonstrate that our urban air is remarkably different from what it was decades ago. Cars today emit fewer smog-inducing organic compounds, while other sources are now becoming important contributors to air pollution. D5 is only one component of personal care product emissions, and many other compounds could be emitted with it. To fully assess how seriously these emissions may affect the environment and human health, researchers have to answer many more questions. What other compounds enter the atmosphere after we apply personal care products? Once in the atmosphere, what happens to them? Are they capable of contributing to smog formation? Our lab and others around the country are considering these questions now in hopes of improving our understanding of urban air pollution.